Native Spanish Tapas and Spanish Jamon Iberico go hand in hand, during our Madrid tapas tours, we offer and explain the difference between a real acorn fed Iberian ham and a normal Serrano pig. Do not hesitate to contact us for any information about our Madrid tapas tour or our Madrid walking tour or about acorn fed ham. Acorn fed Iberian ham, comes from the Iberian pig, autochthonous only in the Iberian Peninsula (Spain and Portugal). Iberian products are considered gourmet, they are sold in two ways, sliced vacuum packed cold-cuts or the entire leg of ham to take to your home. The front legs of the ham are considered the best, although they have less meat to bone proportion. A lot of our customers during our Madrid tapas tour, ask us how much of the acorn fed Iberian ham is actually used and how much of the acorn fed ham is thrown away. In ratio, about 60% of the acorn-fed ham is actually consumed, because to start carving it, we must cut through thick layers to actually get to the juicy acorn fed ham meat. But we do not only consume the meat, we also take advantage of the bones which give our traditional Spanish stews an indistinct and delicious flavor. 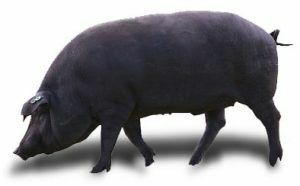 In fact, we have a saying in Spain that says: “we take advantage of all the pig including the way it walks”. Another question asked by our Madrid tapas tour clients is how much acorn fed Iberian ham do Spaniards consume? The answer is unfortunately not as much as we would like, because a real acorn-fed ham can be expensive if bought in shop, anywhere between 18,00€ to 30,00€ for 100 grams, depending on the percentage of acorn the pig consumed. Most Spaniards actually buy the entire leg of ham to take home for special occasions like, Christmas, birthdays etc…, because it is very expensive instead most Spaniards consume the Serrano white pig ham, which is very tasty too. We offer both at our Madrid tapas tour, come and join us for some of the best Spanish tapas in Madrid.